I believe that hunting is a proven way to maintain a healthy population of animals in today’s society. And when I say hunting I mean all types: waterfowl, big game, and rodents. When I read or hear of diseases popping up or spreading, like I heard about the plague here in Colorado today, it raises some serious concerns about the health and well being of the environment and its residents. We are supposed to be managing those areas! 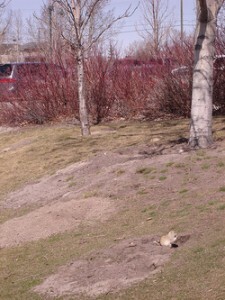 In Colorado the tree huggers (as I call them) were able to lobby and get the prairie dog protected on public land here. In areas with high populations of people such as the Peoples Republic of Boulder, the cities and counties started buying up parcels of land known around here as open space to create buffers in-between cities. Well as you can guess as with any piece of property in the west that is unused and not managed properly, it becomes infested with prairie dogs. If you have never seen what damage a prairie dog colony can do to a piece of farmland you would be amazed. On an adjoining piece of property to the one that I have permission to hunt geese on, the previous owner had a fondness for the rodents and did nothing to control them. When the new owners of that 50 acre parcel decided that it was time to claim back the property from the prairie dogs, they hired a company to come in and kill the little critters. They charged 2 dollars a hole, 2700 holes later and a truckload of money they were able to get them under control. Now that was just on 50 acres! Could you imagine what the damage would be on a half section or even a quarter section of land? Also, a friend of mine who works for the Longmont parks and recreation office was put in charge of a study to find out how much it would cost to relocate these disease carrying rodents because it would be against the law to poison them. He contacted a government certified agency to get the quote. Now hold on to your seat, because you are just not going to believe this! It was almost $400 dollars per animal. To relocate a town of 100 animals that would be $40000.00 of tax payer money – to get rid of a disease carrying nuisance that if properly managed and exterminated would cost a fraction of the money. But now, because we have let people that have no clue about game management dictate how a species should be saved, I read that some of our parks are being closed because these same little rodents that we have allowed to overpopulate and destroy property now have the plague and are a danger to our pets, children and us! When are people going to figure out that to manage a species, you can’t just let them run wild, you actually have to have a plan and manage them. Photo by Kevin Saff . This entry was posted on Wednesday, May 9th, 2007 at 8:58 am	and is filed under Colorado, population control, prairie dog. You can follow any responses to this entry through the RSS 2.0 feed. You can leave a response, or trackback from your own site.